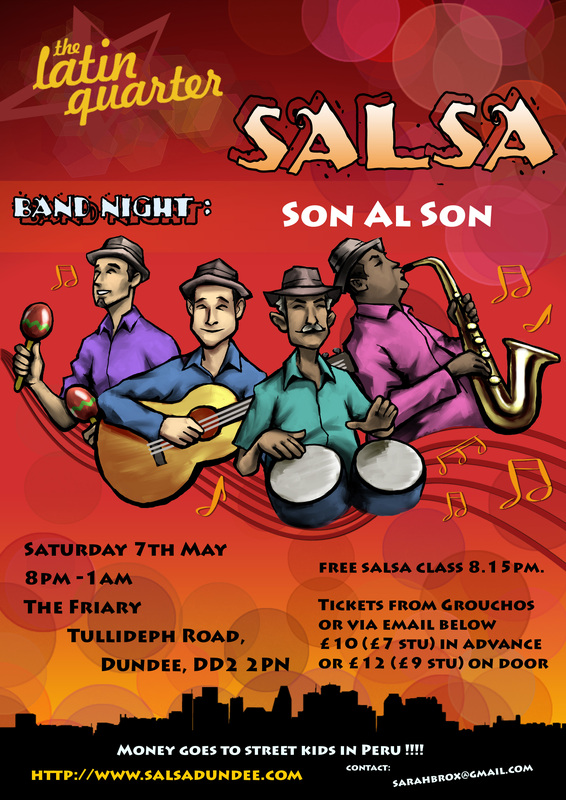 Remember £2 DISCOUNT on pre paid tickets from Grouchos ( Dundee) for LATIN QUARTER CHARITY SALSA BAND NIGHT. Spice up your life with Latin band Son Al Son, bound to get up up dancing or toe tapping ! The Friary is a large hall with huge dance floor, The Friary is the large building on left on Tullideph Rd as turn off Lochee Road, Dundee DD2 2PN. Tickets £10 (£7 students) in advance from Grouchos, or £12 or £9 (stu) on the door. Groups can reserve a table for between 8 & 12 people by emailing sarahbrox@gmail.com. Please help advertise , click on the poster & pop one up somewhere if you can. Doors open at 8pm with a FREE salsa beginners class at 8.15pm, band will play 2 sets starting with the 1st around 9.15, evening ends at 12.30am, latin music for dancing inbetween band sets. There’s a raffle too and an AUCTION for a Umbrian hamper with goods straight from Italy. Money raised for the Azul Wasi project for street children near Cusco, Peru.